Angelo's spent 18 months transitioning from South Jersey to South Philly. Angelo's Pizzeria had its soft opening in the former Sarcone's Deli in the Italian Market on Tuesday, bringing the shop to the end of a year-long transition. The shop originally grew a fan base over five years in Haddonfield, New Jersey, but owner Danny DiGiampietro announced it would move to South Philly in August 2017. 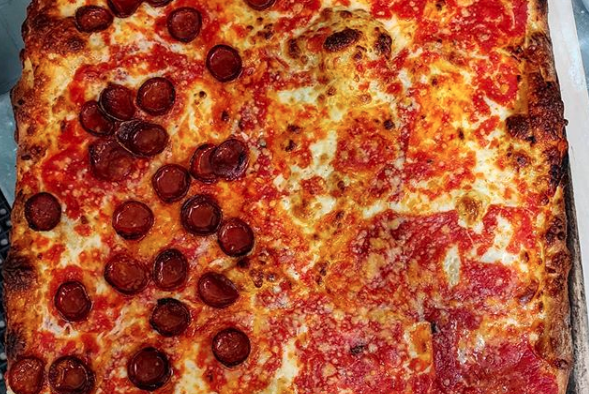 It's famous for its thick-crusted and cheesy upside-down, Trenton-style and the Grandma pies. Billy Penn reported Angelo's pizza oven was made in Italy and has been the source of some delays in getting everything up and running. But on Instagram on Wednesday, DiGiampietro announced they successfully held a quiet soft opening at 4 p.m. on Tuesday, but not without hitting a few snags. "We started last night with a brand new crew in a brand new shop with no POS system and it was a little hectic to say the least so I apologize to anyone who may have been upset," he wrote. Oh, and the shop is hiring if anyone is interested. According to Angelo's social media, the new hours for the time being will be Tuesday through Sunday, opening at 4 p.m.